Sitting in a bus on the way from Toronto to Montreal, this seems like the only chance I'll get to update my blog. Anyway, I know I have a long post about my US trip pending, but this one is going to be about my experience in Canada, more specifically Vancouver. I entered the country on the 7th August from San Francisco. The United Airlines flight I flew didn't serve anything to eat, but I wasn't feeling too hungry anyway. The flight was pretty decent, and on time. We touched down in Vancouver at around 22:55, and I headed off to immigration. Had to fill out one of those customs forms before deplaning - the one that says that you're not carrying animal products, diseases, chemical weapons or case in excess of $10000. I wasn't. The immigration official was really nice. He greeted me with a bonjour, and when I told him that I'd done some work with the Canada home page, he said that it was about time I'd visited Canada and let me go through. My uncle and aunt met me outside the terminal and we drove home, but my uncle suggested that I try flying in to Bellingham in Washington the next time and drive in from there - that way I don't need to take an international flight, which is more expensive. Headed out the next day to explore the city of Vancouver. A few things stand out about it. It's on the coast - on several coasts actually, there are waterfronts on three sides. It has excellent public transport, though the frequency is lower during off peak hours. They can spell and measure correctly (apart from the word tyre which they spell tire), but that's true about all of Canada anyway. There are a lot of gay couples on the streets. I took the SkyTrain into town. You can get a day pass from the station, and use that for all of TransLink's services which include the SkyTrain, the SeaBus and all the public transport buses in Vancouver and North Vancouver. This really cuts your costs down a lot. The day pass costs $8 and is valid for unlimited trips in a day. The SkyTrain gets you into the centre of town at the waterfront, from where you can take the SeaBus to cross the creek to Lonsdale Quay, but we'll get to that later. 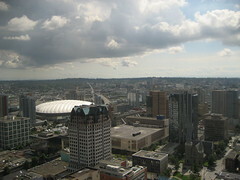 You could instead get off earlier, at Science World, Stadium, Granville or Burrard and walk around those parts of town. There's stuff to do, mainly shopping, but also some sight seeing around there. If you go all the way to the Waterfront, you can start at the Vancouver Lookout. Get out of Waterfront station, and cross the road to the Harbour centre. Get a ticket for $13 - valid for the entire day, and go up to the top to get a 360 degree view of Vancouver and surrounding towns. On a clear day you can see forever. You can also decide where you want to go from here, because there's loads of tourist brochures available at the top in case you missed them at the Waterfront station. Once you're done here, get out of the Harbour centre from the Hasting's St exit and turn left to head to Gas town. Gas town is the place where Vancouver was founded, and it still has old cobblestones and some old architecture. The stores in there are very modern though, for example, there's an Internet domain registry a few metres in. There also used to be a Vancouver history show in there, but they seem to have gone bankrupt and the whole place is being auctioned off sometime this August. 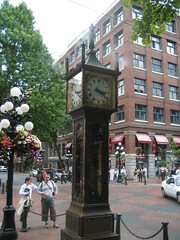 Walking down Gastown, you'll come across the steam powered clock. You can't miss it. It's a clock about 10 feet tall, has steam coming out the top, and tourists waiting at its base. It lets out a steam whistle on the hour, which is what all the tourists wait for. I didn't. 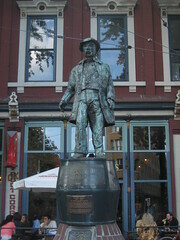 Head further down to the end to find the statue of Captain Gassy Jack - the founder of Gas Town. As the story goes, the area was wilderness except for a solitary sawmill that processed wood from the nearby forests. The mill owner did not permit alcohol on his premises. Captain Jack promised the mill workers whiskey if they'd build him a saloon, and they built it and had it operational within a day. So, whiskey came to the land, and the economy flourished with Gas town - and later Vancouver growing around it. The town gets its name from captain Gassy Jack, who got his name because of the tall stories he told. There are guided tours of gas town that start from the statue, but you'll have to find out the timings. You can leave Gas Town soon because you'll probably want to get back for dinner anyway. The next thing you can do is take the SeaBus from Waterfront station to get across the creek and take bus number 129 or 130 from there down to Lynn Valley. The bus stops just outside the park, and hiking trails. Cross the road and look for sign boards. 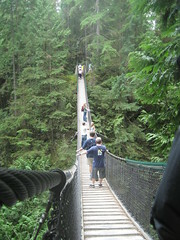 Lynn Valley has a suspension bridge and a couple of hiking trails that you can walk along. Alternately, just go down to the rocks and sit by the shallow stream. Be careful though because it gets rough as it goes along, and people have lost their lives here. The suspension bridge itself is not as long as the Capillano Bridge which is where all the tourists head out to, but there's a huge difference in price as well. The Capillano bridge is $26.50 for people from outside British Columbia, while Lynn Valley is free for everyone. There's also fewer crowds at Lynn Valley. I chose not to do the full trail - mainly because I had a laptop and tripod on my back, but many people did go through. I prefer hanging out near water, and it was very inviting. The water is cool and very clear. You'd feel like bottling some of it and carrying it with you. It's constantly flowing, and flowing fast, so my guess is that it would be fairly pure. 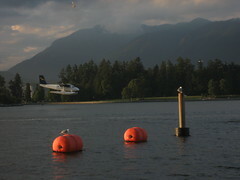 Once you're done with Lynn Valley, take the same bus back, and cross back to the Waterfront. You have several choices here. I chose to take a right and walk down by the Sea wall. There's a little park by the waterfront and that's also the place where all the sea planes land. Quite an interesting audio-visual experience if you've never seen it before. There's also a few restaurants out here, but they look fairly expensive. While walking, I saw a very expensive looking BMW parked on the side of the road with the windows rolled down. The car was still there when I walked back a few hours later. I don't know what that says about the crime levels in Vancouver, but that same night there was a shootout at one of the local nightclubs. I kept on, and reached the famous Stanley Park. Now, when I got in, I thought a park was a small thing. Central Park and Hyde Park were two of the largest parks I'd seen in the world, but I could easily walk across them in a short time. Stanley Park is nothing of the sorts. It has a couple of lakes, a pond, a Native American village, a couple of Hiking Trails, a forest, a boating club, an open air theatre, several gardens and a highway going through it. Grease - the musical - was playing at the theatre as I passed. It's easy to get lost in there, so keep your eye on the map and on the various landmarks around. A second option would be to walk down from Waterfront to the Burrard bridge. You can cross the bridge on foot, or take a ferry across. You'll find the Vancouver Museum, the Maritime Museum and the space centre on Granville island. It's not really an island, but I'm guessing it was at some point. Vancouver also has a bunch of farmer's markets that are open on weekends, so if you get a chance, go down there and mingle with the locals. I've been in love with farmer's markets ever since I visited Borough market in London. I'd also suggest looking up Upcoming for stuff to do in Vancouver on the days that you're there, and maybe even contact some of the locals on CouchSurfing and ask them. I've found both places very helpful. Now, if you've been heading along at a good pace, you've probably still got a bit of daylight to go. That's assuming, of course, that you're travelling in summer, which is the best time, for various reasons. Let's talk about food first before we go further. Vancouver is very multi cultural. You'll find every cuisine in the world here, but there is the Vancouver flavour added. This is where asking the locals on couchsurfing comes in handy. Many of the restaurants I saw were multi-cuisine, with flavours from Greece, South America, Lebanon and Asia all in one. There's also specialty Korean, Japanese, Mexican, Italian and Indian places. I lunched at a restaurant called Character's and had a Greek dish called Dolmates. This is vine leaves stuffed with mince and served with a thick white sauce, roasted potatoes and tsatsiki. Now tsatsiki is a special greek dressing that goes well with just about anything. I've had it with gyros before, and now with this. A must try. I can't say that there's any cuisine that's specifically Canadian, or a Vancouver speciality. They just add something with the blend. As sunset approaches, head back to Gas town. The place is all lit up by night, so walk around again, and maybe get some dinner here. If you're willing to spend a lot on dinner, you may want to eat at the tower instead. 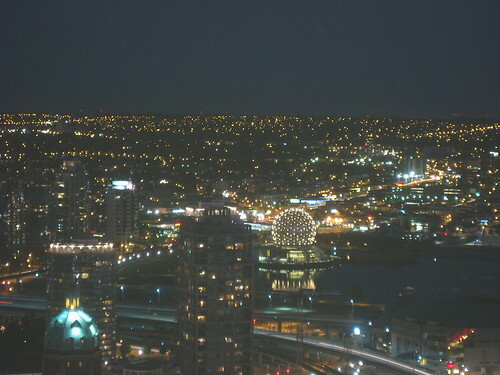 Head up to the Lookout and get a view of Vancouver by night. The ticket you bought earlier in the day is still valid, so you don't need to spend any more. If you're going to take pictures here, make sure you have a lens with Vibration Reduction, or use a tripod. Long exposures can really enhance Vancouver by night. If you're spending more than a day in Vancouver, you could take one of the city tour buses. There's the grayline opentop buses and there's the green trolleys. They cost $12, and you can go around in 2 hours, or you can get off the bus at various stops to explore and stretch it over the entire day. They also sell tickets for various attractions on the bus itself. On the way out of Vancouver, I decided to use public transport. I took the SkyTrain into the city, and had lunch with an old classmate of mine. Then headed down to Burrard station and caught bus number 491. The day pass works on this as well. The bus runs through most of downtown before it gets out of the city. It starts at Seymour and Davie, and heads to Hastings, then Burrard Station, then Nelson, Howe and Granville before heading south for the airport. 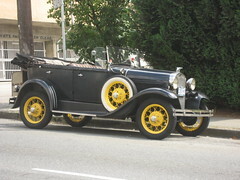 Burrard was late enough in its route to avoid another city tour, but close enough to not make me walk too much. I walked a bit down Dunsmuir, Howe and Hornby before getting to the bus stop. 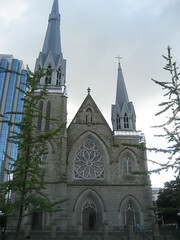 The art gallery and court house are on Hornby, and there's a Roman Catholic Cathedral on Dunsmuir that's built in Gothic style. This is also the only church in Vancouver where the bells are rung by hand during Sunday mass. Now bus number 491 won't take you all the way to the airport. It takes you to airport station, where you need to change buses. Cross the road from the bus stop, and walk into the bus terminus (there's also a few bus stops on the road, but these aren't what you're looking for). You need to find the stop for bus number 424. Route 424 heads to the airport terminal and then further on. You'll most likely find a lot of travellers around here, so just follow them. Make sure you get off at the right terminal. Visit the translink website (http://translink.bc.ca/) in advance to figure out what you want to do. This could also help you in planning your trips around the city and getting schedules. After a while at the airport - there's no free wifi btw - I boarded Westjet flight 626 for Toronto. I'd already checked in online, so I only needed to pick up my boarding pass and check my luggage at the airport. Security was fairly painless. There's no concept of "Selected for Secondary Security Screening", better known as SSSS on your boarding pass, but you do need to scan your laptop separately. Goodbye Vancouver, and I hope to visit again. I'm sure there's more for me to do, but I'll do that when I've planned well.